A while back I bought a book by Kenneth Morgan called Labour People: Leaders and Lieutenants, Hardie to Kinnock, Out of the 36+ people this book covers only 3 of them are female and one of these is only mentioned in association with her husband. So I thought I’d do my version of Labour People, a whistlestop tour of some of the people (especially women) who make our politics so interesting but often get left out. 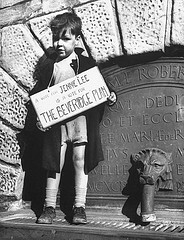 I kinda have to start with Jennie seeing as she’s emblazoned across the top of my blog. 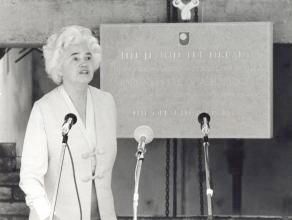 Often dismissed as Nye Bevan’s wife Jennie Lee is an intensely fascinating woman and one of my heroes. The daughter of a Scottish Miner Jennie was brought up in a fiercely socialist household where such leading lights of the ILP such as James Maxton and Robert Smilie were frequent visitors. Jennie was often known as the high priestess of socialism, never bending in her principles. Jennie Lee was elected to Parliament at a by-election in February 1929 when she turned a 2,028 Conservative majority into a Labour majority of 6,578. 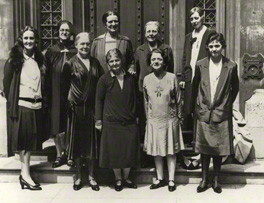 At twenty-four she was the youngest member of the House of Commons. She was also too young to be able to vote for herself. Immediately Jennie found herself at odds with the PLP and broke convention, both by choosing to reject the sponsors chosen for her in favour of her old friends and by launching a blisteringly ferocious maiden speech attacking the government. After the unexpected death of her lover Frank Wise in 1933 Jennie married Aneurin Bevan in 1934. 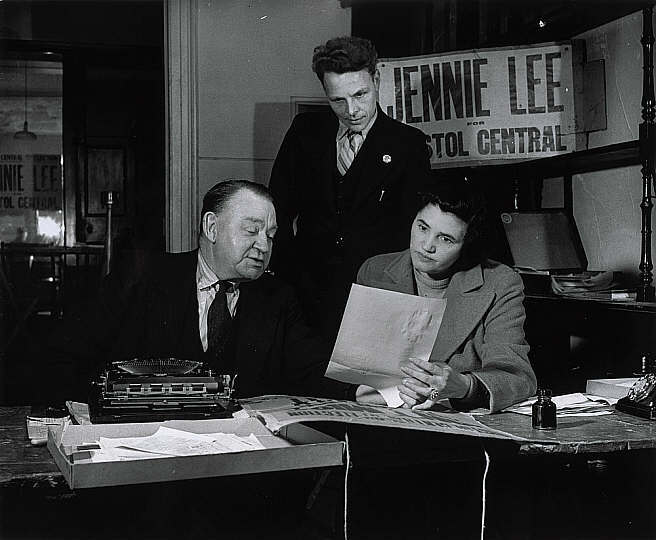 Between her defeat and re-election in ’45 Jennie wrote articles for left-wing journals and newspapers and lectured in America, Canada and Europe. She raised funds and awareness of the Spanish civil war and international brigades, worked with Lord Beaverbrook on defence, factories and blimps, was House of Commons reporter for the Daily Mail, maintained a regular column in Tribune and stood for election in Bristol Central on a promise of full implementation of the Beveridge Report. However when re-elected in ’45 Jennie had made too many enemies and wasn’t given a position in the new government. Instead she chose to support her husband and step out of the limelight. It is easy for me to behave in a way that would smash both our lives. I see no way in which I can save both. If only one is to be saved it must be yours … You cannot adjust to suit me. You simply could not do it. Not only your own ego would be outraged. All the external pressures of the contemporary social framework would be on your side. It is the woman’s part to give way, to make life smooth, to walk by your side. Although she often disagreed with Bevan’s more pragmatic socialism (when compared to her holy flame) she attempted to remain in this position until his death in 1960. Although she was often blamed for Bevan’s walkouts and resignations she may have merely been an easy target, “the dark angel at his shoulder”. Near the end of Nye’s life and after his death Jennie was able to resume her own career, She became a member of the National Executive Committee from 1958-1970 and was chairman from 1967-1968. More importantly she was able to create a lasting legacy which continues to this day. In 1951 Harold Wilson had joined Bevan in resigning from the cabinet over health service charges and Korea. This can be seen as the moment which truly created Bevanism. During this time Wilson had got to truly know and appreciate Jennie and in 1964 invited her into his government. The position of Minister for the Arts was created especially for her and she threw herself into it with gusto. One of the early problems she faced was that the Arts Council had settled into a position of excellence over access, rather than arts for the many it had become the best for the few. This led to them favouring professionals over amateurs, London over ‘the provinces’, and within London they focused on the national companies over smaller ones. Jennie refused this mindset and refused the idea that there was an inherent conflict between excellence and access, more did not mean worse. Although the establishment was scared of the wide eyed, fiery radical they soon began to appreciate her once she’d trebled their budget in six years. They still sneered about her lack of artistic credibility but once she had pushed through the South Bank National Theatre, a half century old project, they came to respect and even admire her. To Jennie no was not an answer and she used every means at her disposal to get her own way, including funneling most of the money she gain to the regions (no more snarky comments about provinces were allowed around her). She encouraged local authorities to support not only libraries and museums, but art, music and drama in their schools; to aid amateur groups; to run local arts centres even in the smallest towns. A doctrine of ‘response’, it meant that the Arts Council would not parachute into a city to impose some version of London high culture; rather it would only respond to and support local initiatives, local bids, grounded in the local community. In many ways we owe Jennie a lot for her championing of local art and regional centres of excellence. However she was not finished there. Harold Wilson assigned her to finding a way to make his ‘University of the air’ a physical possibility. And so Jennie poured her immense energy into creating what has been called the greatest achievement of Wilson’s Labour Government, The Open University. She felt that adult education should be more than ‘dowdy and mouldy… old-fashioned night schools … hard benches’. Lee was mindful of the fact that Adult Education was, as the OU’s first Vice-Chancellor, Walter Perry, put it, to be ‘the patch on the backside of our educational trousers’. Her 1966 White Paper, A University of the Air made it clear that ‘There can be no question of offering to students a makeshift project inferior in quality to other universities. That would defeat its whole purpose’. Lee was defeated at the 1970 election in Cannock by Patrick Cormack and she retired from frontline politics when she was made Baroness Lee of Asheridge, of the City of Westminster on 5 November 1970. She died in 1988 from natural causes at the age of 84. There is so much more that could be said about Jennie, so below I have linked places where I have gotten quotes, information and general knowledge that I hope will be of interest.